Click the Funding tab on the right side of the screen. Your default Group and Account will be pre-selected. If you have multiple accounts, click the blue Account button in the top right corner. 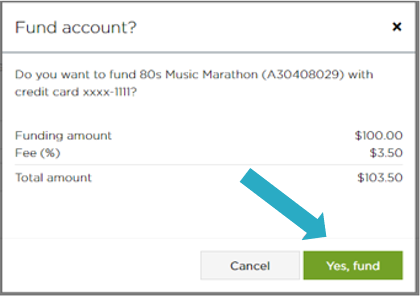 Then, click the Switch Accounts button if you need to fund an account different than the one you're currently in. Click Add Funds next to the credit card that will be used for the transaction. Enter the amount you'd like to add, and click Add Funds. A pop-up window confirming your request will appear. Click Yes, Fund to confirm. You'll receive an email that confirms the transaction along with all of the details. Looking to learn more about Rewards Genius? Sign up for our weekly webcast here!